There are many buildings from the 1970s that I would want knocked down, but one called la Maison de la Celle Saint-Cloud is not one of them. 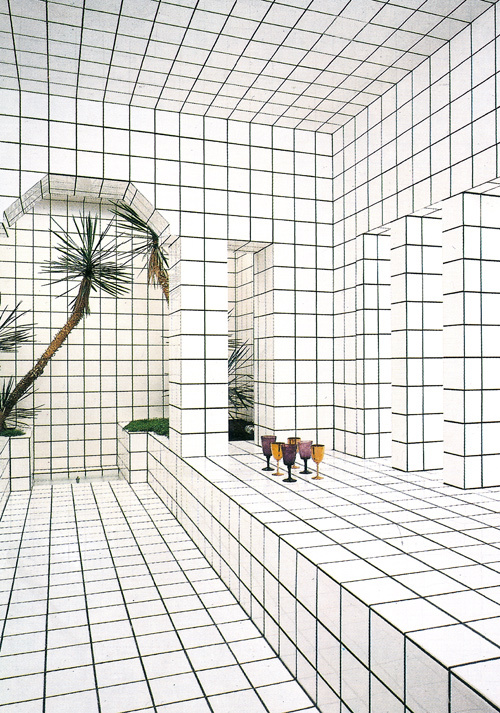 Opened in 1974 in Paris and designed by Jean Pierre Raynaud, the place is completely tiled, an endless black and white grid. As ornate Persian tiles hint at the wonders of the universe beyond, this is a monument to the modern world. For me, it would be a struggle not to take some colouring-in pens. Unfortunately, it was closed in 1988 and demolished in 1993. The building is no longer, but the modern world lives on. Despite the dissection and analysis, Barolo will defy attempts to be put in a box. But what happens when you try? There is a rebellious spirit to this fine wine region, so that many producers end up singing, as Sid Vicious did, “I did it my way.” So it was with some trepidation when I went to the first Barolo tasting of the year at Fine + Rare where I tasted 90 + Barolo from 2010. An incredible survey of the vintage that had Walter Speller (Jancis Robinson) fly over from Italy for the opportunity. Instead of groups of wines per region, producers were set out from A- Z (as is the London Street map). My final notes became a matrix of the vintage x producer x regions. 1. The UK wine trade looks at the region as subsets of a whole concept (a) Piedmont and then (b) greater Italy. This is not how many Italian producers think in my experience and is the hardest to achieve on the ground. Yet this is important in the mind of the customer. Some may be surprised to learn many customers are just getting their heads around Barolo, let alone the idea of Barbaresco. 2. There is a strong correlation in the mind of the UK trade between Burgundy and Barolo by looking at the producer before the commune or vineyard at this stage. 3. The line between modern and traditional winemaking is blurring. The arguments between winemakers at a local level in the 1990s are becoming, or already are, irrelevant. 2010 could be the vintage to end this argument that bores even the original proponents. 5. The story is important (the people, land and the food) but this comes after the taste and quality of the wine. Many of these points will change when there is more depth in knowledge from the trade and customers, especially the commune and vineyard differences. For someone who needs to know the story of the wine, and does not drink wine without knowing its context, point 5 is problematic. In Barolo, there is plenty of story. How to assess Barolo apart from its food (I admit I had to leave after 45 wines for a sneaky panino to bring back the saliva in my mouth and not be attacked by tannins) and see its development over time is a big question when it comes to Barolo. This is the difference between Barolo and Burgundy. Tasting wine in Burgundy from the barrel, the wines are more complete. Barolo can taste fractured at this stage of their development and the tongue becomes dry after so much tannin. I would like to taste the whole lot again in ten years, if possible! Overall, what I can say about the 2010 Barolo vintage? Even if you go off the grid you can’t go far wrong. A brilliant survey of Barolo 2010 by Fine + Rare. 27 March 2014 GRAZIE!